Rear View Mirror Glue - Which One Is The Best? Rear View Mirror Glue – Which One Is The Best? It can be frustrating to drive along when your rear view mirror falls down. When this happens it’s important to reattach it quickly as this can help you stay safe. One of the best ways to reattach your mirror is with rear view mirror glue. The key is to find one that will outlast the rigors it will face due to humidity and any rear view mirror accessories you choose like fuzzy dice. For older model vehicles, many mirrors attach directly to the glass, therefore all you would need to buy is an adhesive. One of the better ones to buy is Customs Accessories Rear View Mirror Adhesive as it provides durability and can hold up well even if you add rear view mirror charms. If you have a newer vehicle, you may need more than rear view mirror glue to complete the reattachment. Popular Mechanics recommends you purchase an installation kit. You can find many of these at retailers like Walmart or auto parts stores. When you decide which one to buy do not opt for discount ones, but instead go for a better quality. 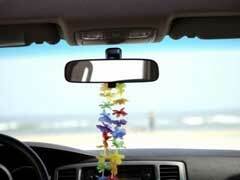 You may also want to buy another mirror like a blind spot rear view mirror, which can help you locate other drivers. After purchasing a kit, you’ll want to install it in good weather. Ideally, you want to do it when the temperature is in the ballpark of 50-70 degrees. If you have to replace it in the winter, find a heated garage to do the installation. If it’s summer, park in the shade on a less humid day. The first step during installation is to remove the metal button from the mirror. It is rare on most modern cars to use rear view mirror glue to attach it directly to the glass. Before applying the adhesive, you need to do two things. First, make a small mark on the side up side of the button. This ensures you apply the rear view mirror glue on the correct side. Next, you’ll want to remove any remaining adhesive. Most kits include sandpaper which will help you with this process. From there, you’ll want to use rubbing alcohol to clean the glass before reattaching. Now you are ready for the most important part. Take a razor blade to cut open the rear view mirror glue and put a small amount on the button. Size up where you want the mirror to go then push the button onto the glass. You’ll want to hold the button in place with some pressure for up to a minute according to Popular Mechanics. From there you will be all set.